If I can add a degree of insight :-). I worked in The Middle East for years where the usual 'hot' periods get up to 50 C/122 F for days at a time. If you do not drink a lot of water 'regularly' and keep your skin from getting exposed to the hot sun, you're basically "<deleted>. They don't wear those long flowing toques for fun. Not only alcohol, but sugar will take you out. Drinking in an a/c tavern then trying to walk in the heat can take you to your knees. For diabetics or sugar junkies, the same thing can happen. Now here's the kicker. If there's a power failure because the power grid is overloaded, many people are going to be in a world of hurt. Imagine being on the 25th floor or in an elevator/lift and the power goes out? The high heat is also about how well the power company has built the power grids to withstand periods of high usage (power surges) but that's a whole different story. Time for Antactica to open worlwide Embassies and offer retirement visas? Bring it on, I didn't leave frigid Canada years ago to freeze here as well. Ahh yes, someones coloured the fluid tube with a red pen, saves costs on filling the tube with liquid. Damn clever these Chinese, they don't miss a trick! You seem to generalize, far too much, if only talking about Thailand, you might be right, but hey, Australia is much larger, than many countries, with a wide range of climatic zones, and the weather forecasters are usually spot on. There was me waiting for it to snow, now summer is about to start, oh well, will global warming, maybe snow next year. when isn't it scorching in the summer months here? Last 5 years or so have seen regular 40+ temperatures in the North East, same in the far west clear of the mountains. what are the financial requirements going to be? Hard to have 'liquid assets' in Antarctica. Mind you, the houses are cheap, just build your own igloo in a couple of hours. Several off-topic troll posts have been removed. This is the News Forum gentlemen... not the pub. I wondered why there was no slot to put the money in? Current amount of atmospheric insulation (a.k.a. greenhouse gases) is higher than at any time in 3-5 million years. most of the energy (>93%) gets stored in the oceans which warm slowly, but are warming consistently. [https://www.theguardian.com/environment/2018/nov/22/climate-heating-greenhouse-gases-at-record-levels-says-un ] The fluctuations in annual temperatures as felt on land depends upon whether the still warming oceans have the warmer water going deep, or sitting at the surface. This is especially noticeable in the east Pacific. 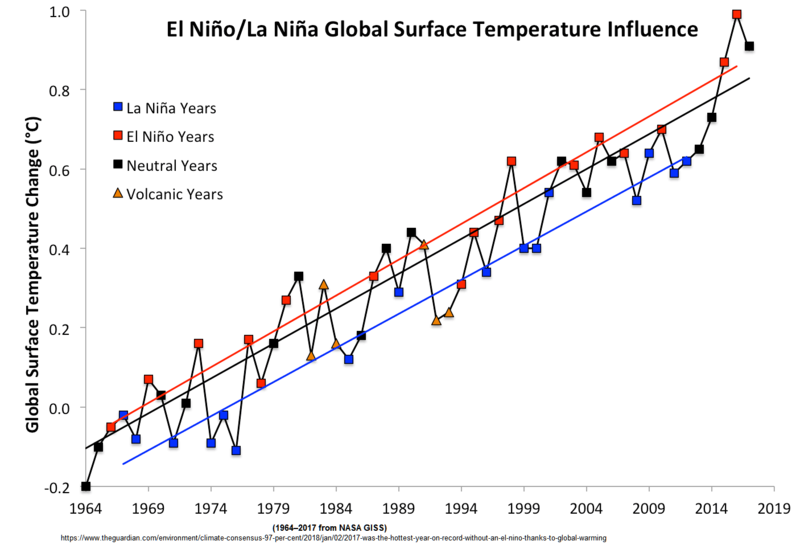 When the warm water is at the surface, the weather pattern is called an El Nino and for El Nino years that warm surface water heats the air above, which then warms the atmosphere globally - more so than otherwise. 1998 and 2016 were strong El Nino years, but the overall pattern of the planet is on a warming trend line. Due to the slope of warming globally, even the neutral year of 2017 came in as the 2nd warmest year since accurate measurements have been gathered widely. 2018 was a weak La Nina year, so slightly cooler (with more rain in the Western Pacific monsoonal season). 2019 looks to be another El Nino year, but it won't be known until May or June how strong an El Nino it will be. Thus, 2014 - 2018 form a 5 year streak of all five of the warmest years on record. Even a weak El Nino is poised to supplant 2017 for 2nd warmest year on record globally. ... and while La Nina years have more rain in the eastern Pacific / SE Asia, La Nino years have less rain. An expert is a person who is correct 50 percent of the time and not sure about the other 50 percent. My nightmare here is a power cut on a really hot summer season afternoon here and the aircon stops! Luckily it has only happened twice in 13 years! Once you've stripped naked there's nowhere to go....lol. Hot season is going to be hot. I would never have guessed. You're wrong if you believe that the climate isn't being changed because of humanity's behaviour.